Hello everyone. I have been recently working on improving the Skyrim CE textures, mostly by eliminating ones that would see limited use and adding in ones I had missed. 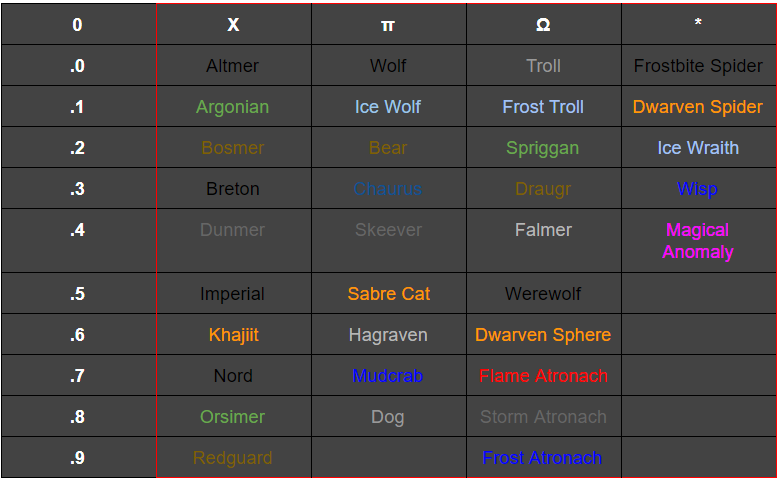 I think the table is pretty comprehensive, but I would love your feedback (especially if you have some hours in Skyrim itself). 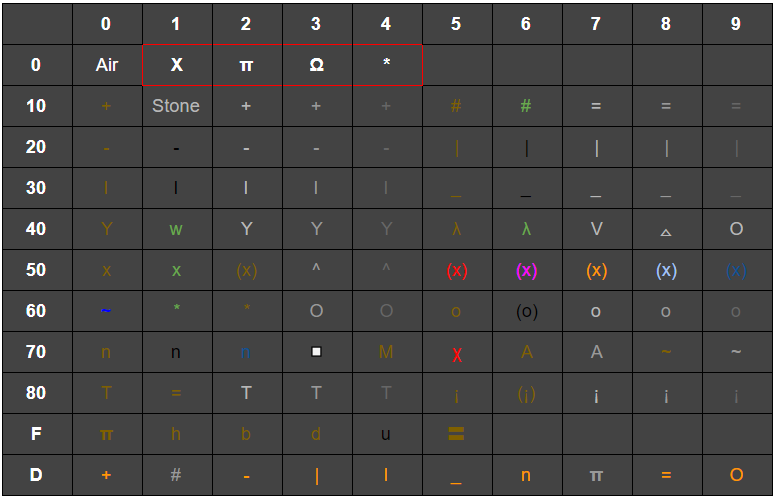 The textures in (parentheses) have extra details drawn on them (on top of the character itself); for example, #66 (black 'o') has a cross in the middle to look like a window. The row 'F' is the Furniture set (beds, chairs, tables, etc.) and 'D' is the Dwemer set (pipes, gates, etc. ); these textures are interchanged depending on what sort of sector the player is in. I plan to add more of these interchangeable sets (if you have any suggestions feel free to shout 'em out), and theoretically these would be the primary method for modders to add new objects/textures. All of the entities in a given column are represented by the same character at the top. As you can see, there are still some gaps in the table(s). There is a lot of room for more entities (I would probably leave some room here for modders), and I need to fill out the Furniture texture set. Based on your Skyrim adventures, if you think any of these textures would lie barely used or I am missing textures that would see a decent amount of use, please let me know. And, of course, I am always happy to answer questions. Thanks and happy coding! The more time passes the more your project become bigger and bigger. Maybe with all the usb interface works it could be possible to manage a 32Go SD ram card interface with a arduino nano. It could be very intersesing for people to program in good conditions. To store maps,pictures,music... yes i said music because such an interface would take 4 pins so it let 8 to manage some buzzers (1 by channel) or a more evoluate sound box quality with a Pi. (personnally i prefer an arduino nano solution to embed all with (3 AAA +nano+buzzers+an rgb led+nano main circuit+some free switch for future extension/captors) around the ti-84 in a shape of inclinated bed). The most challenging thing is to arrive to read the usb input. Actually some can send signal. As far as i understood to read usb input it need an rsa key. But i think with a little iron solder, we could connect 8 keys and imagine a 8 bits transfer protocol. Good luck for your project kg583, it's gonna be a very very interesting game. There are 273 users online: 8 members and 265 guests. Members: commandblockguy, Jeffitus, mr womp womp, RogerWilco, Sam, _iPhoenix_. © Copyright 2000-2019 Cemetech & Christopher Mitchell :: Page Execution Time: 0.275172 seconds.